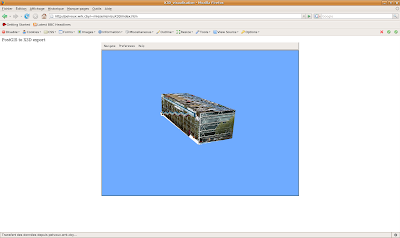 Another export function I decided to create is asx3d(). X3D is the VRML successor and describes an XML syntax. So it's a 3D format which is fine to use in a web environment. 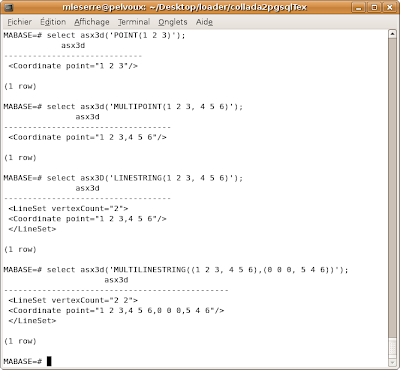 I also developed a command which creates x3d files by exporting geometries from PostGIS. Use this option to specify the name of the file to create. If not present, the result will be printed on stdout. Allows you to specify connection to a database on a machine other than the default. Allows you to specify a database port other than the default. Connect to the database with the specified password. Connect to the database as the specified user. Specify the geometry column to be exported. This option is necessary. Specify the texture name column to be exported. Specify the texture coordinates column to be exported. !!! : If one of -t or -uv option is given, the other one must be given too. Specify the observator's position at the beginning. Specify the color of faces which are not textured. must be the names of the alias you give in the subquery. In these examples the names of the database, the table, the geometry_column, the texture_column and the texture_coordinates column are respectively MABASE mytable the_geom, the_texture and coorduv. 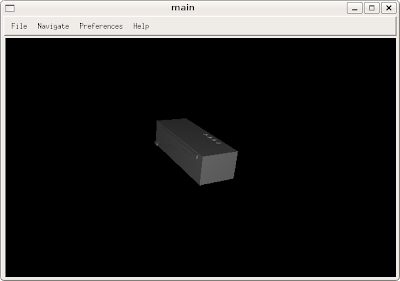 You need an X3D viewer to see testfile.x3d. X3D is the successor of VRML, so, most of VRML viewers works for X3D too. You can use for example freewrl which is a free software you can get here. An advantage of X3D format is that it's easy to use in a web environment because of its XML syntax. 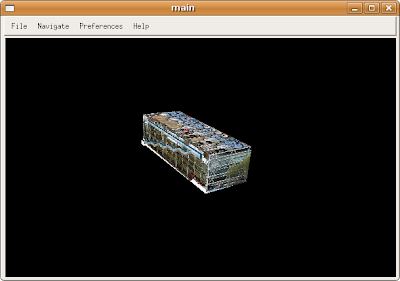 Unfortunately, x3d plugins for web browthers aren't really competitive for now. The best solution seems to be the use of FLUX Player, available on MediaMachines website, and Internet explorer on Windows. Indeed, consequents geometries could need about a minute to be loaded.